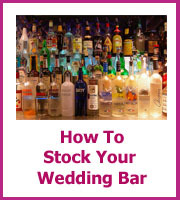 Your cheap wedding reception menu doesn't need to look cheap and with today's economic climate you want to make sure you get more for your money. 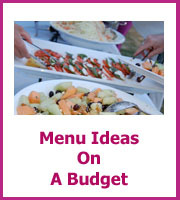 To finding cheap food ideas that are so yummy no one will care how little it has cost you. 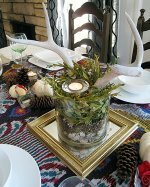 Take a look at the articles below for foodie inspiration that will leave your guests happy and full! 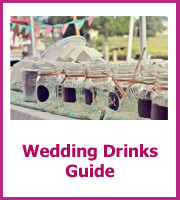 The drinks that you serve at your wedding are just as important to keep your guests happy! 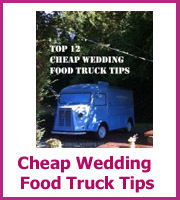 The biggest food trends can help when you are planning your wedding menus even if you are doing the catering yourself or hiring a caterer. 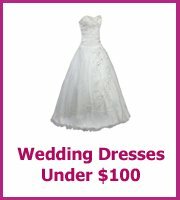 Save yourself a fortune by having butler passed or waiter served hors d'oeuvres during your reception drinks or cocktail hour. 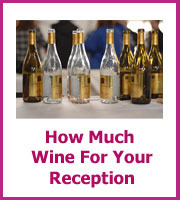 Sounds mad that you would save money but your guests are less likely to over indulge when they are being served rather than helping themselves from a buffet counter. 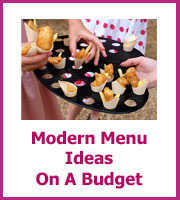 This is also a great way to portion control the food, two shrimps in a shot glass with a tomato salsa, miniature jacket potatoes stuffed with sour cream and caviar, smoked salmon on toast, miniature hot dogs and hamburgers would also add a fun element. These dishes all look expensive but because you are only serving them in small portions the food costs will be small, serving them with a reception drink rather than having everyone help themselves is important. 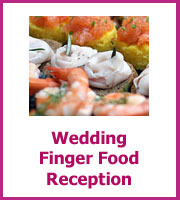 If you time your wedding reception to be in the evening, 8 - 10pm your guests will not expect to be having a sit down meal and a cocktail and canapes/ hors d'oeuvres reception are becoming increasingly popular. 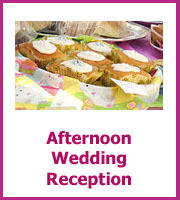 If you time your wedding reception to be in the afternoon 3pm - 5pm you can have an afternoon cheap wedding reception menu with cakes and scones and of course your wedding cake. 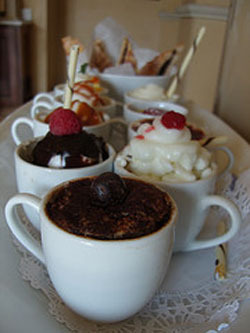 Serve with Champagne and/or cups of tea and you will have a perfect afternoon reception that will not look cheap. Make sure your cakes and scones are displayed beautifully on cake stands at individual tables or a full buffet table. Speak to a local baker if you are planning on catering the event yourselves and you will be able to get some classic cakes to add to the display. If you have friends and relatives that would love to show off their baking skills then invite them to bring their show piece. Make up labels for all of the cakes to make it look like an old fashioned cake shop. 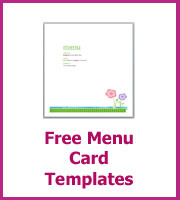 If you want to provide a meal for your guests then there are a number of cost saving trends that would work perfectly for your reception menus and that make the event fun and more interactive with the food. International flavors are increasingly popular as more people are travelling and are more interested in Interntional cuisine. Theming your meal around food that you love and that you know your guests will love is a great way to have some fun with the food choices. Morroccan stews are great as they are tasty and filling, plus they are fairly cheap to make, the biggest cost will be the meat but as they are slow cooked cheaper cuts can be used to produce amazing flavors. Other popular choices are Asian cuisine, you could have chefs stir frying your guests meals in the room which will add a theatrical touch to your meal. 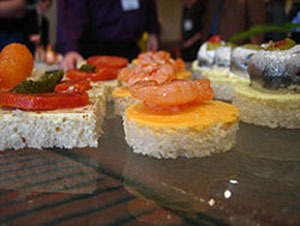 Have your guests choose the raw ingredients from a buffet station and then have them cooked in front of them. 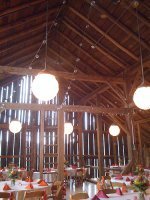 Again, your food costs can be kept fairly minimal you could have a waiter man the buffet station with the meats and seafood to ensure everyone gets a taste. 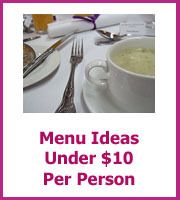 Other cheap wedding reception menu buffet ideas are to have salad stations, soup bars, risotto bars and even mashed potato bars. 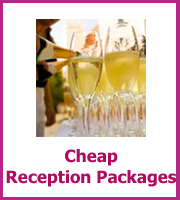 All of these add a sense of fun to the reception add sophisticated touches and noone will think that the food was cheap. A great food trend that is not going away is comfort food with a twist; shrimp cocktail served with finely grated horseradish, Boeuf Bourguignonne, Coq au Vin, Lamb Tagine. Just think about your favorite dishes or a local delicacy, even sausage and mash done well can be on your cheap wedding reception menu. Desserts fit easily into the comfort food trend, favorites from childhood and those naughty but lovely chocolate puddings are perfect for your wedding reception. Freshly baked bread smells fantastic and having a local baker provide you with local goodies; sour bread, ciabatta, farmhouse or the more adventurous chilli breads and seeded breads would look great on a bread buffet served with a bowl of seasonal soup is a cheap but tasty starter and very filling! 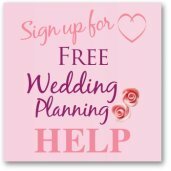 Don't just think that you have to have a sit down meal, more couples are choosing to have picnics in the park, barbeques on the beach and dessert receptions. 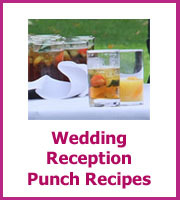 These ideas work well for a more informal reception. 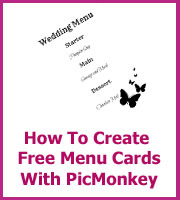 When you choose your cheap wedding reception menu think about the foods that you and your guests love, add creative touches to make it look like you spent a fortune and enjoy your day!